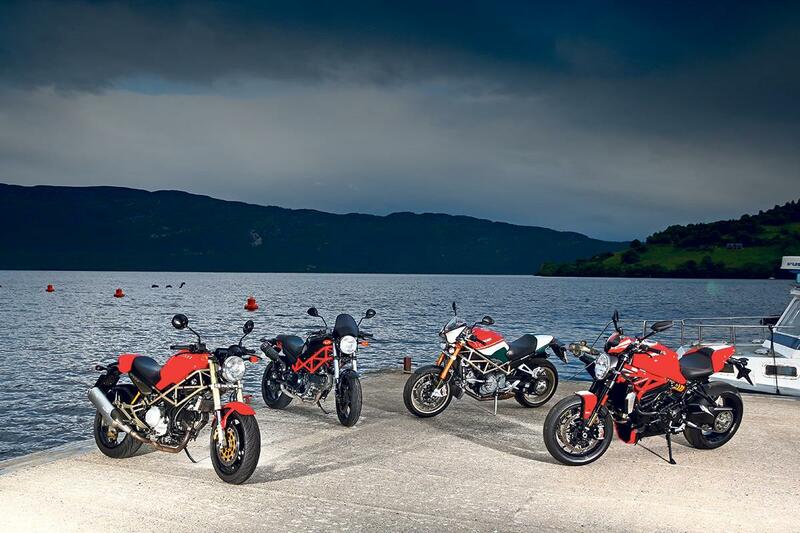 300,000 Ducati Monsters have been sold since the range was inroduced in 1993 with the air-cooled 904cc M900. From 1993 to 2000 the Monster family accounted for 42% of all Ducati's sales and helped steer Ducati through some troubled times to keep the Bologna company trading. 23 years and 37 models later the Monster family is still going strong. Below is the complete timeline of the Ducati Monster. Ducati unveils the M900 Monster. By combining a steel trellis chassis based around the 888’s unit with an air-cooled 904cc sohc engine from the 900SS, Ducati gives its Monster agile handling and loads of gutsy drive as well as café racer styling. The £7500 price tag is its only issue, a FireBlade cost £400 less. The first small capacity Monster is unveiled. Taking its styling cues directly from the M900, the M600 uses a smaller 584cc air-cooled 600SS motor in a lower specification chassis with a single front disc. It proves a massive hit all across Europe, thanks in a large part to its budget £5000 price tag. Keen to build on the success of the M900 and M600, Ducati transplant the 700 Sport’s air-cooled engine into a fairly basic Monster chassis. A kind of halfway house between the budget M600 and premium M900, the M750 costs £6800 but fails to capture the public’s imagination. It is discontinued a year later and briefly rebranded the M750 Dark in 1999. Ducati releases the first of its ‘dark’ Monster models, the M600 Monster Dark. This new subclass of Monster comes with a mean and moody look thanks to black paint on their tanks and plastics and silver instead of gold painted frames. The lack of red also drops a few quid off their retail price. The new Cromo is little more than a M900 with reflective chrome-look finish on its tank, but it is a toe in the water by Ducati to see if by creating special editions, as many owners were already doing themselves through customization, it could tempt more owners to buy its naked bike. Having seen the benefit, and ease, of creating higher specification models with its 748 and 916 sportsbike range, Ducati try the same trick with the Monster. Avoiding the traditional Öhlins route, Ducati instead upgrade the M900’s Showa suspension to make its forks fully adjustable and the shock a bit better while adding carbon side panels, mudguards and a small fly screen to give a sportier look. Two small letters after the Monster’s name signified that the 2000 M900 was the first Monster to gain fuel-injection. Alongside injectors, the M900 also received a refresh with the S model’s uprated forks now standard fitment and a digital dash replacing the old unit. The motor is also refreshed to produce more power and torque. Ducati takes the controversial (at the time) step of introducing water-cooling in the shape of a retuned 916 motor into the Monster range. The S4 is the sportiest Monster to date but the jumble of cooling hoses detracts from the bike’s traditionally clean look. A big year for the smallest capacity Monster sees not only did it gain fuel-injection, but its capacity also increased to 618cc and its name changed to M620ie. The first ‘S’ model small capacity Monster is also released and the M750 gains fuel-injection. To celebrate Foggy’s success in WSB, Ducati releases a limited edition Foggy Rep S4. With a more powerful 916 motor, uprated suspension and a unique paint scheme, only 300 Reps are built. With the likes of the Aprilia Tuono now on sale, Ducati ups the power of its water-cooled Monster by using a retuned 996 engine. To separate the water-cooled bikes from the air-cooled ones, a single sided swingarm and stacked pipes are also added. More of an update than a full-on redesign, the M900ie grows in stature to become the M1000 thanks to a larger capacity 992cc motor. It is joined in the range by the higher specification M1000S and also an M800 with an 802cc air-cooled motor. While the actual bike isn’t changed, Ducati adds its APTC (Adler Power Torque Clutch) to reduce the heavy clutch lever action and also add a slipper clutch element. This system is still used on current Ducati models. The short lived S2R 800 and subsequent S2R 1000 give the air-cooled two-valve Monster range a bit of style by adding the stacked pipes and single sided swingarm from the liquid-cooled models. As the M900 has grown in capacity, Ducati also gives the smaller capacity Monster a bit more poke through a larger capacity 695cc engine. The rest of the bike remains virtually unchanged. The most bonkers and aggressive Monster to date arrives in the shape of the RS. With Öhlins suspension, lightweight wheels and the 998 testastretta motor from Ducati’s sportsbike, it’s a wild ride. For the first time since its launch in 1993, Ducati completely overhauls the Monster’s look. With underseat pipes and a stubby and squat stance, the new M1100, M1100S and M696 models also gain radial brakes as well as heavily revised motors and chassis. Having avoided them for so long, the Evo model now adds traction control as well as ABS to the top of the range Monster’s specification. The traditional dry clutch is also consigned to the bin, replaced by an oil-cooled unit. With the liquid-cooled testastretta 11-degree engine replacing the air-cooled unit and a new sporty attitude, not to mention the very latest technology such as ride-by-wire and a full electronics package, the latest generation of Monster is unveiled and both air-cooling and the 2-valve sohc engine disappear. The Monster 821 takes over from the M696 as the smallest capacity Monster in the European market, killing off the last of the 2-valve sohc air-cooled bikes. Like the M1200 models, it’s a new generation and features all the latest tech. 2016 sees the most powerful Monster to date launched in the shape of the M1200R. With a fearsome 158bhp at the rear wheel, it makes over twice the power of the original air-cooled Monster M900. Hankering for a Ducati Monster? Visit MCN Bikes For Sale website or use MCN's Bikes For Sale App.